Home maintenance tasks may not be your favorite thing to do as a homeowner; however, home maintenance is crucial in the upkeep of your home. Plus, proper home maintenance is the best way to save yourself a ton of money on repairs and damages caused by neglected equipment. So do yourself a favor this spring and don’t skip these vital maintenance tasks. 1. Clean Your Refrigerator Coils. Hey, it’s spring cleaning time anyway, you might as well add the refrigerator coils to your checklist. Regularly cleaning your refrigerator coils will save you money on an expensive repair bill down the road. These coils can be found either at the bottom or in the back of your refrigerator. Over time the coils become clogged with dirt, dust, hair, cobwebs, etc. when this happens your fridge can’t release heat properly, leading to the compressor having to work harder and run for longer periods of time, this waste an excessive amount of energy and can greatly shorten the lifespan of your fridge. 2. Clean Your Dryer Vent. Each year, nearly 16,000 home fires are caused by lint-clogged dryer vents. According to the Consumer Product Safety Commission, these clothes dryer fires result in 20 deaths, 370 injuries and over $75 million in property damage each year. The steady, silent accumulation of fabric particles that get beyond your lint screen will not only decrease your dryer’s performance, it creates a fire hazard. Cleaning your lint trap after every load will slow this process, but cannot prevent it. As your vent gradually becomes caked with lint, your dryer’s airflow decreases. This not only prevents your dryer from drying as it should, it can cause it to overheat and ignite the highly flammable lint. Cleaning your dryer vent this spring can help protect your family and your home. 3. Remove The Built Up Sediment From Your Water Heater. Drain a quart of water from your water tank every 3 months to remove sediment that impedes heat transfer and lowers the efficiency of your heater. Follow the manufacturer’s directions or call us at (866) 844-3770 and we’ll take care of your water heater for you! 4. Clean Those Gutters. Removing the leaves and other debris from your gutters this spring will help prevent your gutters from getting clogged. Springtime in the Midwest is known to be a rainy time of year and clogged gutters can lead to expensive roof damage, flooding and damage around the foundation of your home, damage to your downspout or the gutters themselves. It is a lot easier to keep your gutters clean than having to deal with a headache and expense that comes with allowing your gutters to become clogged. 5. Have Your Sump Pump Operation Tested. Spring is the time for rain in our area and that means your sump pump will be working overtime. That’s why you want to make sure having your sump pump tested is at the top of your home maintenance checklist this Spring. If your sump pump fails, you can expect serious basement flooding and the expense that accompanies repairing all of the water damage. Call us at (866) 844-3770 to have a professional plumber come out and ensure your sump pump is working at optimal levels. Needing a change? Are you looking for a new career that will provide for you and your family? Have you ever considered becoming a plumber? A career in the plumbing field offers dozens of benefits and with the shortage of tradespeople now is a great time to consider making a switch into the plumbing field. 1. Job stability. If you’ve been bouncing from job to job or have been finding it difficult to find gainful employment, becoming a plumber will provide you with the stability you’re looking for. Plumbers are always in high demand, because no matter how poorly the economy is doing, everyone still needs to keep the water flowing. Making your career in the plumbing field recession proof. 2. The plumbing field has a lot more variety than you might think. When people hear the term plumber, they often picture someone fixing a leak or repairing a broken water heater. But the plumbing field has so much more to offer! A plumbing career will help you develop a wide variety of skills, everything from technical repair and installation skills to customer service and sales skills. 3. You’ll be in control of your future. You can choose to make your plumbing career into whatever you want. Start as a skilled laborer and work your way up to a master/licensed plumber on your own schedule. In the plumbing field, your future is in your hands! 4. You get to work with your hands. If a typical nine to five behind a desk sounds like the worst idea ever to you, then a trade job in the plumbing field is perfect for you. 5. Avoid student loans and massive amounts of debt. Trade schools, community colleges and apprenticeships are considerably more affordable than a traditional four-year college. Our company even offers on the job training to compliment or in place of traditional course work. If becoming a plumber sounds like something you might be interested in, click here to learn more about our open positions. Spring is finally here and you’re ready to get outside and enjoy the beautiful weather. But before you head outdoors, consider adding a few of these electrical upgrades to help enhance your springtime experience. 1. Have some outdoor lighting installed around your patio and/or garden. The days may be getting longer but that doesn’t mean you’ll be ready to head back inside when the sun does go down, so add a few lights and stay out as late as you’d like. You can opt for subtle, softer lights to illuminate your walking path or go for more eye-popping, party lights. The styles, designs and functionality options are endless! -Line your walkway with hanging electrical lanterns. Just imagine your lush garden lined with beautiful lanterns, all lit up on a lovely spring night. There are thousands of designs and style outdoor lanterns you can choose from. Plus, once you have lanterns professionally installed, they are fairly easy to maintain and if you choose the right type of long lasting light bulbs, you won’t have to worry about constantly changing burnt bulbs. – If hanging lanterns aren’t the kind of outdoor electrical upgrades you’re looking for, try lining your walkway with accent lights. Accent lights can either be embedded in the ground or above ground with lights that almost look like little lamps, stuck in the ground. Both options offer unlimited possibilities for style and design so you can choose the best option to fit your personal style. Many people like to opt for the in-ground lighting option because this option makes lawn maintenance easier. – For a truly stunning outdoor lighting effect, opt for string lights. When you hear string lights, you probably think Christmas lights, but string lights offer so much more possibilities than that! Just imagine relaxing on your porch or garden at night, with a beautiful display of string lights hanging overhead. 2. Install an electrical fire pit. Electrical fire pits provide you with all of the benefits of a traditional fire pit, without the headache of having to chop the wood yourself. 3. Have outdoor outlets installed. Outdoor outlets are some of the best and handiest electrical upgrades available. Imagine how convenient it would be if you had a weather proof outlet in reach every time you wanted to plug in an appliance, radio, etc. And outdoor outlets aren’t just handy for spring, you’ll also be happy to have them when the holiday season rolls around and you don’t have to run ugly, heavy extension cords all over the place. Our Certified Electricians can expertly install an outdoor outlet just about anywhere you desire. Get Outside and Enjoy Spring! Allergy season is upon us! If you suffer from allergies, you know that spring can be a rough time of year for you. Taking a deep breath can be a real challenge with all of that fresh pollen, the extra animal dander from your pets losing their winter coats, the large amount of pesticides being sprayed outdoors and don’t forget about the dust mites, fungi, mold spores, etc. invading your home. But spring allergy season does not have to be so miserable! There are several steps you can take to drastically improve your indoor air quality and your quality of living in general. 1. 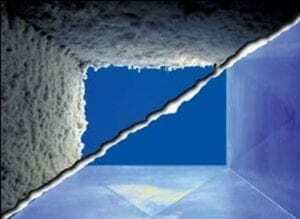 First and foremost have your ducts cleaned and sanitized! Dirt, dust, mold, bugs, mites, even rodents and other allergens are all l iving in your duct system. We can get rid of it all with our Total Source Removal cleaning process. Tiger’s process starts with our patented Toro-Vac industrial vacuum being directly connected to your ducts. It works to draw all debris towards our powerful vacuum and out of your duct work. Simultaneously, Tiger administers our spinning powered airbrush that works to knock stubborn dust and dirt from duct walls and pushes it towards the Toro-Vac vacuum. After each vent has been cleaned thoroughly and all dust has been collected Tiger then administers a patented sanitizing solution which works to kill mold and microscopic bacteria and leaves behind a fresh scent. Tiger’s process is the most thorough duct cleaning process in the market today. Not only will it leave your ductwork sparkling but it will help with your family’s health and protect your heating and air conditioning equipment helping to prolong its overall life expectancy. With a thorough duct cleaning and sanitizing, allergy season will be no match for you. 2. Get your spring cleaning on. Dusting, vacuuming, and mopping weekly is a great way to rid yourself of dust mites and animal dander that is accumulating in your home and getting into your air. 3. Change/upgrade your air filter. Most heating and cooling systems still use a basic air filter. These filters were originally designed to protect the equipment and not the people served by the equipment. The average air filter is only capable of removing 3–5% of the particles that pass through it. Today, however, there are several types of permanent air filters available in various efficiencies that can help you filter the air in your home. If you suffer from allergies, asthma, hay fever or other breathing difficulties, there is an air filter that can help you. We can even provide you with the same type of air filter used in hospital operating rooms. 4. During allergy season, laundry is your friend. Washing your bedding and other linens at least once a week will go a long way to improving your indoor air quality. Dust, animal dander and other allergens like to collect on fabric and you breathe these in at night. P.S. Don’t forget to wash your pillows once in a while, to remove built up allergens. 5. Keep a dry basement. Basements, especially unfinished basements, like to attract and retain moisture. This moisture leads to mold, mildew and odors; a good dehumidifier can go a long way this allergy season. 6. Use the power Ultraviolet light Technology. Tiger has found that the most successful way to handle system mold is through Ultraviolet (U.V.) germicidal lights. Ultraviolet li ght has been used to kill microorganisms in hospitals, barber shops, laboratories, pharmaceutical plants, and at the nation’s Center for Disease Control. Residential ultraviolet units have been independently tested and proved to be effective in the constantly moving air environments of heating and cooling systems, killing mold and bacteria quickly and effectively. The UVC energy attacks the organism’s DNA and either destroys it immediately or prevents it from reproducing. For most people, the original motivation for installing the lights is to put a stop to indoor air quality complaints and/or allergies. However, they are also pleased to learn that many hidden odors are also eliminated with U.V. technology. Tiger can easily install these lights in your home and you can begin enjoying the health benefits that come with them. Good Luck This Allergy Season!